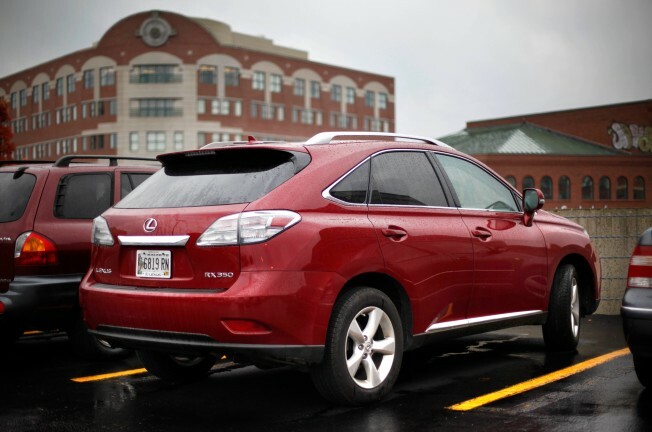 A Lexus RX350 is parked in Portland, Maine, Thursday, Oct. 21, 2010. Toyota is recalling 1.53 million Lexus, Avalon and other models, mostly in the U.S. and Japan. The models affected by the latest recall in the U.S. include the 2005 and 2006 Avalon, 2004 through 2006 non-hybrid Highlander and Lexus RX330, and 2006 Lexus GS300. This has been Toyota's annus horribilis. The Japanese automaker has been lurching from recall to recall, tarnishing its once-vaunted reputation for quality and giving its competitors, including U.S. companies, an opportunity to try to dig into its market share. The latest recall involves more than 1.5 million vehicles worldwide. Toyota said Thursday it is recalling Lexus, Avalon and other models, mostly in the U.S. and Japan, because of potential brake fluid and fuel pump problems. It's “another black eye” for Toyota, a leading industry analyst suggested, especially for a company that once was seen as the benchmark for safety and quality, but which has had to recall more than 10 million vehicles over the last year alone. Toyota's seemingly endless series of recalls began in October 2009, when it announced it would take steps to resolve a problem with so-called sudden acceleration in its vehicles. That recall, blamed on loose floor mats that could jam the throttle on a variety of Toyota products, was followed by another, in January 2010, resulting from a potentially sticky accelerator assembly. But Toyota has also had to recall millions of other vehicles ranging from the 2010 Prius (which has had issues with potentially defective brakes) to some of the carmaker’s pickup and minivan models, which have experienced excessive corrosion severe enough to cause spare tires and other parts to fall off while driving. Joe Phillippi, chief analyst with AutoTrends Consulting, and others caution it will be difficult, if not impossible, for Toyota to ever fully regain its once-lofty perch as a bastion of automobile safety. And other makers are clearly taking advantage of that challenge. Ford, for example, has been heavily emphasizing the array of new safety features it will incorporate in the all-new 2011 Explorer SUV, which hits showrooms in December. That Explorer is a good example of how bad things can go wrong for an automaker. A decade ago it was the dominant sport-utility vehicle with sales at one time topping 400,000 annually. But a problem with faulty Firestone tires set in motion a series of challenges that have since relegated the Explorer to an also-ran spot on the SUV sales charts that Ford is still struggling to overcome. The latest Toyota recall is relatively benign, though potentially serious. In all, about 740,000 vehicles sold in the U.S., including the 2006 Avalon sedan, Highlander SUV and Lexus GS300 models may experience unexpected oil leaks from their master cylinder. “This one will probably go away [quickly] because there were no major accidents or deaths,” said Phillippi. Meanwhile, a number of additional models not sold in the U.S. were found to have faulty fuel pumps that could lead the vehicles to unexpectedly stall. All told, 1.53 million Toyota and Lexus models are impacted. Toyota is trying to put as positive a spin on the news, emphasizing that it has been taking aggressive steps to uncover potential defects before they lead to serious problems. Indeed, the automaker has noted that it knows of no deaths or injuries related to either recall. “This is the best they can do” — to try to make lemonade out of lemons, Phillippi said, adding that a huge recall is not the sort of issue a company wants to contemplate, especially in light of all the other problems Toyota has seen lately. The automaker has been slammed for nearly a year for reacting slowly to previous safety issues. The October 2009 callback was announced only after a California police officer and members of his family were killed during a fiery crash when the floor mat of a borrowed Lexus came loose and jammed the accelerator pedal. Meanwhile, Toyota agreed to pay a record $16.4 million fine levied by the National Highway Traffic Safety Administration for failing to respond in a timely manner once the maker learned of the potentially sticky accelerators. CEO and Toyota family heir Akio Toyoda was grilled mercilessly during a series of Congressional hearings last spring. In those hearings he promised to take actions to prevent further safety defects — and to respond more quickly when recalls proved necessary. Since then, the maker has taken a number of steps, including the appointment of a North American quality “czar.” And, if anything, Toyota officials have warned that their increased focus on safety might, indeed, lead to more service actions. But the company was nonetheless hoping that the worst of its problems were “behind us,” as Don Esmond, Toyota’s second-highest-ranking American executives suggested during an appearance before the Detroit Automotive Press Association, last week. Esmond claimed that sales have been gaining — albeit with Toyota luring customers back with the biggest incentives in its corporate history — and that surveys show its reputation is improving. The company has also taken to the airwaves to help rebuild its once-sterling image with ads that emphasize its renewed focus on quality. But even there it is drawing flak. Legendary consumer advocate Ralph Nader weighed in last week when he questioned a Toyota ad claiming the maker is investing $1 million an hour in research and development. Nader said the ad seemed to indicate that money was going specifically into safety research and asked Toyota to clarify the claim. Toyota has since indicated that the money is used to fund broader development efforts. So with significant damage already done to its image, it remains to be seen whether Toyota will be able to easily put another recall behind it. American car-buyers may have been willing to move on from one massive Toyota recall, but they might not be quite so willing to forgive the carmaker and move on from a second one.